Last week, I wrote the article, "Judgment of Islam." It focused on two massive terrorist attacks in Iraq and Pakistan that left over 278 people dead. I took note of how the members of the Muslim faith were committing one horrendous crime against humanity after another, and Islam in general was suffering little impact. My article could not have been timelier. As most of you already know, there was a terrible terrorist attack (yes, I said terrorist attack) at Fort Hood in Texas. Maj. Nidal Malik Hasan gunned down thirteen people and wounded thirty-eight at the post's military processing center. It was the worst mass murder event at any U.S. military base in our nation's history. 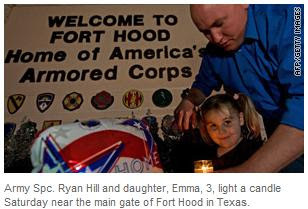 “Fort Hood tragedy: An Army officer, a Muslim convert, is the suspect in a shooting spree." "I wish his name was Smith,"
implying a concern that this will lead to groundless fear of Muslims. "Muslims across the country were shocked, angry and afraid that the attack would erode efforts to erase anti-Islamic stereotypes." The problem here is that the stereotype fits extremely well. The vast majority of terrorist attacks on planet earth are carried out by Muslims. There have been several plots against American soldiers by Muslims. In June, three Ohio Muslims were found guilty in a plot to kill troops in Iraq. In August, a California man was sentenced to seventy months for a jihadi plot to kill Jews and attack military bases. Last December, five men were found guilty of plotting to kill Fort Dix soldiers. There are about 3,500 Muslims in the U.S. military. With about a million active duty forces, the number of Muslims is only 0.35 percent of the total. With their numbers so small, any incident should cause alarm bells to go off. Several witnesses said that Hasan shouted "Allahu Akbar!" before opening fire Thursday. The media always adds that it means "God is great!" in Arabic. Yes, we are also told that Islam means peace. Words that don't match actions need a new meaning. As far as I’m concerned, “Allahu Akbar!” means, "I'm going to try to kill you." "I ask the media people not to relate all the time everything to Islam." I don't think he has to worry about the media. As far as relating goes, it is a fair cop. If you have a pattern of terrorism in a religious group, it needs to be examined for why it is the frequent offspring of despicable acts. The key problem with Islam is that it has no center of responsibility. If I were a member of a religion that had people committing mass murder against innocent people on a regular basis, I'd go shopping for a new faith. There is no collective consciousness in the Muslim world. I doubt any harm will come to Islam. It is protected by the god of this world. The good news is that time is running out. When Jesus takes over, the few Muslims who survived the horrors of the tribulation will be wiped out, and any cry of "God is great!" will only apply to the King of Kings, Jesus Christ.